If you've just created a workbook called Four legs good, open this up; otherwise, you'll need to create a new data model. You may first need to run the script in the above folder to generate the MAM database (not for commercial use or copying). Each percentage shows the ratio of sales for the current filter context to total sales for the South quadrant. It makes sense that the selected figure should be the only one to be exactly 100%, as this is the only cell containing total sales for the South quadrant. Get the quadrant to appear for each transaction. 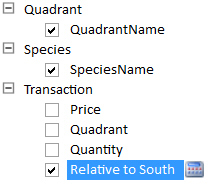 To get this to work, use ALL to refer to all of the transactions, then filter this to show only those for which the quadrant is South. When you've got this working, save this workbook as Enough Orwellia, and close it down.